DLE Cards are one of the best forms of advertising. You can use these cards to encourage clients to enrol in seminars, for product and prices lists or even to enter a competition. 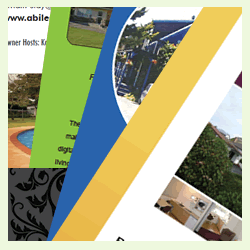 Marketing (Rack) cards are perfect for standing displays in Motels, Information Centres, Holiday Parks. Marketing (Rack) cards are big enough to look at and feel substantial, but small enough to go in a standard envelope for distribution. DLE Marketing (Rack) cards are available in Full colour single and double sided. Email me your photos, logo and information, I will do the rest. Proofs are free.